Simply use Park glueless patches. I have had them last 2 or 3 years. Used correctly they last a long time. Ditto, self-sticking patches. I've carried Lezyne self-sticking patch kits for a couplafew years, no problems. At first I considered them temporary patches but with one exception the Lezyne patches have held securely for a year or more. The one that developed a bubble and leak, I'm gonna blame on my poor technique working hastily in the dark. The Lezyne patch kids are about the size of half a credit card and the thickness of two credit cards. So small and lightweight there's no reason not to carry one. Even diehard roadies who won't use a saddlebag could tape a Lezyne patch kit under the saddle, or just stuff it in a jersey pocket. It takes up less space and weight than a full gel pack. The patches are about as thick as a bit of electrical tape -- ultra thin. No problems fitting the narrowest, snuggest road rim, tire and tube setup. With some punctures I'll use a second Lezyne patch inside the tire itself where the puncture occurred, especially at night if I can't inspect the tire well enough to be sure there's no embedded glass or debris. And the patch kit includes a tire boot -- a sheet of tough, thin plastic with the instructions printed on the sheet. The thickest bit is the metal scuffer. I suppose a diehard minimalist could toss the metal scuffer and use the pavement to scuff a tube to prep for the patch. Might save 1/10 gram of weight. I keep glue and patch kits at home for proper tube fixes later if needed. But the little metallized squeeze tubes of glue will harden within a year or two. So we either need to keep buying glue patch kits or a small glass bottle of adhesive to keep home in the shop. Glueless patches are crap. I have tried a few times and have about a 25% success rate. They seem to work initially but most have failed over a fairly short time. I was on a tour this past summer and got many flats, and used traditional glue-on patches to repair. Every time I got another flat I was worried that the patch may have been the cause, and that I might have to admit it to my touring buddies, but none of the patches failed. I do as Eric S. stated above. I replace the tube on the road with a spare and keep the punctured tube for repair later. I still carry the patch kit too just in case I have a really bad day. I bought a box of Rema patches last year that should last a while since I have 5 family members that all ride on occasion and there are always flats. I haven't bought cement in bulk though, but maybe I will this year. I'm amazed at how many patches I've gone through already too. It just is a constant. I bought this for $10 some time ago but I haven't even dipped into it yet. Tons of patches, boots and a good size tube of fluid for about US$10-12. Originally Posted by Eric S.
looks interesting, but then I looked it up and many of the patches are gigantic! read the instructions, one must allow the thin layer of glue to dry.. Sandpaper area before. Use finger spread glue thinly and evenly, slightly wider than patch shape, takes but a minute or two to dry, then carefully but firmly roll on patch. might be just my habit but I hold thumb tightly over patch for a minute or so and that's it. it's pretty straightforward, patches hold for years. I am surprised how many don't think to, but you can use the foil backing of the patch to spread the glue out. In Japan I picked up a roll-up rubber sheet with backing from which you are supposed to cut out a patch of the size that you need. The disadvantage is that the edges are not tapered. Ive never used non tapered, but thinking about it, I feel the tapering is a help for the patch being nicely securely held on and not having a lip that could get caught or whatever on a tube kept as a spare. Moot point for me, as all patches have tapered edges. True, but even the basic circular Rema patches are too big for a road tube to get a good pressing of all edges so I trim those a bit. Glueless patches to get you home. I also wrap my spare tube and levers in a length of duct tape for use as backup patch. The duct tape is nice to have for other emergencies and will get you a couple of miles of riding on a small puncture. 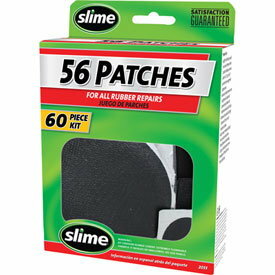 I have a jar of the Slime glue mentioned earlier and a box of patches in my workshop for permanent repairs. I rough up the spot a little, dab of glue, let sit for about 30 seconds, apply patch and then clamp it snugly in my bench vise for a few hours. We've gotten away from vulcanizing fluid drying out a bit, but I'll add that I keep some Gorilla Tape on my Rema boxes. I tried a piece once as a glueless patch and it held air for a couple days. Its outer shell is almost plastic-like and could serve as a boot in the event of a sidewall slash. re using gorilla tape as a boot--thats a good point. Have only recently used that tape and man it is tough, so it certainly would work well as a boot. Never have had to use a boot before, but will touch wood. Never thought to do this as the back of the patch is now exposed until the glue dries giving a chance for contamination. I agree, I only take it off right as I put the patch on, plus I like the taste of the glue when I lick my finger afterwards. No way I'm giving up that. Anyway, alternate uses make it easier to find in many places. Leave the patch on, spread the glue with the back of the foil (that doesn't have the patch on it...), then peel it off when ready to apply. you must be an expert. what tips can you share? what are common mistakes to avoid? I'm thinking using too much glue &/or not letting it dry before applying patch? The most common mistakes I see, when I've watched people try and fail to repair a tube are not sufficiently abrading the area around the puncture and not letting the glue dry. Despite common wisdom about removing "mold release" and such, the real purpose of roughing up is to provide a good mechanical bond for the glue joint. An RMA #2 surface (which is much too rought for a bike inner tube, but what a car tire should be buffed to) provides a three or four fold increase in glue joint area; what you can do on an inner tube is much smoother, so you won't get that much increase, but it's still important. the glued repair is vulcanizing, so there needs to be enough free sulphur in the repaired surface to join in the cross linking. The tube is already vulcanized so there isn't much; increasing the area involved in the patch increases the sulphur available. Letting the glue dry is important. If the glue isn't dry, the patch will move, and the solvent will have hard time evaporating, so the repair will move and not adhere properly. Sand enough, let the glue dry, firm press the patch into place, and you will have very good results. glue on just 1 surface? or both? or does it depend on the patch? methinks you need to read the instructions, or go to that neat encyclopedia thingee, the internet. I can't tell if you are kidding with these questions or not. Normal patches you only glue the tube and waaaait for the solvent to evaporate (several minutes). Then apply the patch with a form press and it instantly "fuses" to the tube. Resist the temptation to "test" the patch by inflating the tube. The patch may separate. Just install as per normal and ride on. Remember to check the tyre for whatever punctured the tube in the first place. methinks you need to read the instructions, or go to that neat encyclopedia thingee, the internet. I can't tell if you are kidding with these questions or not. If not, good luck. thats cool, I shouldnt be a jerk about it. I just looked at how much you have participated in this discussion forum and figured you are a pretty serious cyclist, so thought you were just goofing. and thats ok too, we come on here for fun and discussion. what the other guys have said sums the process up pretty much.